Who’s going to build your app? Let’s imagine that you have an idea for a great new app and you have the necessary budget to make it...so now you must choose who is going to develop it. Choose wisely! The first option - Freelancer – is the cheapest one for sure. If your projects must be cheap and not complicated, you hire a freelancer. Be aware that the more complex projects might face some problems and difficulties if you are up with freelancer. Be conscious of possible mistakes and delays, because there is no support from project management team. Don't even think about additional resources or background. Often freelancers might not fully engage in the project because of the time limit, as he might be working on other projects at the same time. A software house seems to be a better option when you deal with more complex and advanced projects. Resources, professional IT specialists, and time management are big advantages. If the software house works in a friendly environment like Agile, it's very easy to plan everything from the beginning to the final version of the app. Having an organized and experienced team with you is much safer, cheaper and more efficient. In addition, you can build a long-lasting partnership-base which will benefit your company for sure. The cooperation with software house might be valuable for many aspects. Firstly, the quality - if you are working with a trusted company, you can be sure about quality they will provide. Secondly, cost-effective strategy - you will save money during the training and hiring of internal developers. Furthermore, remember that companies are competing with each other, keeping an eye out for new updates, constantly learning and staying on top of latest trends while developing their apps, so be sure your team is made up of skilled professionals and that they are using the latest technology. And the frosting on the cake – software house will deliver on time and provide a friendly environment. The will come up with a sufficient planning progress and suitable plan. The last option is your own development team at the company. The in-house team would be the most lucrative, but it might only be available to large corporations with "unlimited" access to all resources. To run your own team of developers you must include all related costs to infrastructure and project management as well. The image and prestige of the company are vital because it attracts talented developers to work with your team. Features of an app matter and can differ significantly. The hourly rate, in this case, is essential. Shortly, the charges of the developers can be anywhere between $30 to even $250/hr. There are few reasons why the charge may differ, but the location is the key cause. Honestly, in some countries, cost of a professional developer is only about $50/hr, which is unthinkable in countries with a very high standard of living. The first step of the app’s development process is the research or so-called “discovery” stage. It costs about 5000$. The software house (a good one) will investigate your general idea for an app. The main goal of this process is finding and discovering your business needs, ideas, and goals. User experience (UX) design is the process of creating products that provide meaningful experiences, in other words - how a user feels when he or she is interacting with the system. UX is based on several key factors such as usability, utility, attractiveness, desirability, the speed of work etc. At this stage, it is essential to consider the Interface Guidelines for the various platforms that the app will target. Positive user experience is one of the strongest factors in retaining them. In general terms, the UX research and wireframing stage are about how the website or application works while UI is how it looks. User Interface is a finalized interactive field in which the user interacts with the product. Here the product gets its real color scheme, forms and features of the layout details, styles, animated elements etc. At this point, your app should be both aesthetically pleasing and functional. The strategy is complete, the stage is set, and you have your design, now it is ( bez the) time to build an app - finally the process of taking your idea and turning it into an application with some basic functionality. A prototype makes it quite easier to sell your idea to potential buyers who can now personally see the benefits instead of just visualizing or reading the product description. Your development team will start implementing the styles and functionality of your app, it is crucial to fully understand the goals of the application. When the app is ready, all QA process and testing must be considered and implicated. Thanks to that, you will find out whether the app is ready to be launched. Just to be sure about your app's quality and flawless or its amazing features. Extra efforts and additional time spent on testing and quality assurance process will definitely be worthwhile. Marketing is crucial for the process of development of your app. Thanks to effective marketing campaign you can easily promote your app to customers. 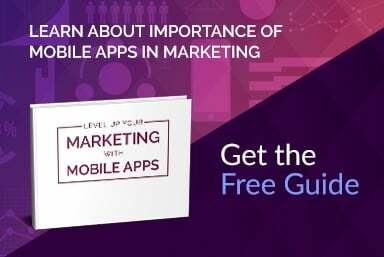 You should remember that spending money on marketing the finalized app is as equally important as the money spent on previous stages of the app development process. During the process, it might happen that the company was not properly prepared for the app development process, so they ended up spending almost all the money for earlier stages, completely forgetting about the necessary marketing campaign. Remember, without a good plan of an app promotion, your business might very likely face spectacular failure. 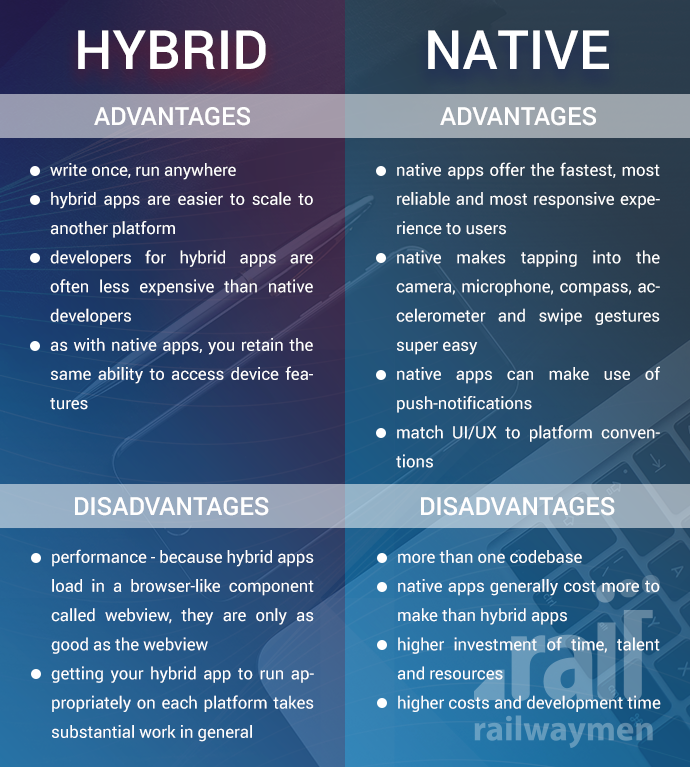 If you are considering building an app, you can choose a native or hybrid app. It has a significant influence on your app's final cost. First, native apps are being developed by developers for a specific operating system - iOS, Android or even Windows Mobile. You can target one or both platforms at the same time. Comparing to a hybrid app, a native seems to have more advantages like stability and better quality. However, creating a hybrid is quicker thanks to using a unique framework, but when it comes to more complex and advanced apps you definitely should develop a native app. Hybrid - a mobile app which combines elements of both native and a web view. Native - mobile app that is written in a programming language dedicated to the specific platform they are being developed for. The client should be aware of the huge costs included in the development of an app. 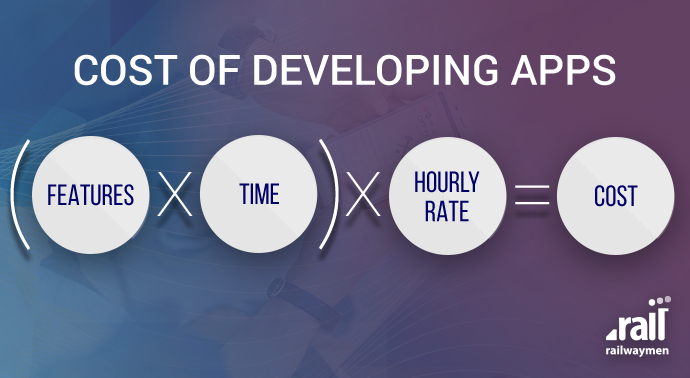 Generally, expenses might change throughout the time of app development process. Communication plays the key role in this case. Finding a common ground between both sites will be for sure beneficial. Software house must be fully engaged in the projects and feel “the spirit" of your idea and understand the vision of your app. The whole process of app development is definitely complicated and requires extra efforts and resources, but with good planning skills and support of the trusted software house, you will turn your ideas into incredible apps. You are not the only one struggling or facing problems with the mobile app development process for sure. Numerous great companies went through the same path – working on a project from scratch, facing a high level of uncertainty but they developed fully-tested, extremely popular and useful applications. Applications that are appreciated by millions of people around the world for their functionality and utility. Creators came up with a great idea, faced problems related to resources and many dilemmas and challenges...just like you. Nevertheless, they have become tremendously successful. Have you ever considered how much does it cost to develop an app like Uber or WhatsApp? Or how long does it take_? Months...years? We have decided to run a new blog series about popular mobile apps and our own cases of developing apps. We will keep an eye out for the most popular apps and their common features for a wide range of apps. If you are curious how does it work or you are planning to develop an app which will conquer the world...stay tuned.